Serve condiments, sauces, and toppings with ease by using this 32 oz. multi-purpose first in, first out squeeze bottle. Its unique design works naturally with gravity to dispense downward, with a wide mouth opening at each end to allow for sanitary dispensing and quick, easy refills. Just open the top label cap, load with your selected topping, and then pour using the convenient dispensing cap on the bottom. What you put in first comes out first, meaning no shaking, fewer stuck ingredients, and reduced waste. The bottle's clear, easy to label cap on top also allows for quick and easy identification of contents. I bought these for tarter sauce and mayonnaise. They’re handy for any thick sauce that you keep in a squeeze bottle since they can be stored upside down. These are OK... But remember that its ANOTHER screw on cap you have to keep track of... and its not the cheapest option. So I started using the 32 oz regular squeeze which are cheaper to replace. These are however better for FIFO operations! Love the first in first out bottle. It’s great and the top and bottom don’t leak. It works well with mayo, bbq sauce, and ranch. Washes well also. Save money buying here. Cool bottle that opens from both ends for easy cleaning. Works best with thinner liquids because thicker ones can create some mess when sprayed out. Although the concept is great, I found that since both ends of this bottle can be removed for cleaning purposes, the bottle is not always necessarily filled from the correct end. Also having two "ends" can sometimes lead to twice the mess. Used these bottles for a short time and then switched to regular squeeze bottles that are replaced each time they need to be filled, which proved to be a better method for our restaurant. Can't say enough about these bottles! Where have they been my whole life. Perfect for home too, we now have the perfect container for making homemade ranch dressing. A container that not only keeps every drop fresh but easy to clean as both the top and the bottom come off for cleaning. A little to big, i think can work in the shape because almost not fit in a hand you need big hands to works with, but is a really great quality FIFO Squeeze bottle. I'm a furniture artist. I do creative furniture restoration & also host classes & workshops. These bottles are excellent for minimum waste. The oversight sites for month without drying up. I'd give 10 stars if I could!!! This 32 oz squeeze bottle is good quality. The plastic is not too soft and cheaply made but just right so you can squeeze it. Just make sure the lids are on tight cause one problem it has if its not on tight enough the dressing tends to come out of the lid. These bottles are great. This larger size makes it great for frequently used condiments so you don't have to refill as often. Both sides open making it easy to fill and easy to clean. They also wipe down easily at end of day. We use this size for our emulsified balsamic vinegar and love it. These bottles are great for the acrylic paints I use. I can store the paint in these bottles along with squeezing out the paint onto my palette. These bottles are good as a way of making sure that product is easy to dispense. We put all our dressings in here and they seal well. We use the FIFO squeeze bottles for our waffle batter. It's so much easier to dose out the right amount of batter onto the waffle maker with a squirt bottle. It's a relief to know we're using the "first in, first out" method. Love these bottles. We use them for mayo and other dressings and they are fantastic! The FIFO concept helps keep the product fresh. Bottles are not thin plastic either, so they hold up very well. I love these gravity bottles! This one is as large as they come, and I use it for condiments for a 7 person family. It works great for keeping everyone clean when dispensing cilantro crema for taco night, and I also use one for holding homemade sriracha sauce. I have put caramel, chocolate sauce, sour cream, hot sauce, ketchup, honey mustard, mayo, you name it through these with no problem. Ingredients can come out pretty quickly, so have a test with any new ingredient to get a feel first - a few things do work better in standard bottles. The hole on the container is very large, so it squirts out too much condiment for use on individual portions. Would probably work better for larger portions where precision isn't as necessary. We appreciate your review, Jenny! If you are looking for a different product that would better suit your needs, please contact our Customer Solutions team. Holds a large amount of pesto sauce for me. Sturdy and solid container that looks like its going to hold up in a our busy kitchen. Lid fits securely and does NOT give the impression that it is going to fall off easily. Great product! It takes a little getting used to if your have been using a spout squeeze bottle, but after a couple of shifts my guys had it down pat. Make sure your dishwashers keep up with the lids on both sides, they can get lost easily. These bottles make refilling quickly much easier. They are also much easier to clean than the standard squeeze bottles. They are definitely worth the extra money. This is a perfect way to dispense large amounts of sauce quickly. The FIFO system means you can always be sure you're using up the dressing that you need used most, first! These are huge time savers. Health inspectors love them too. First in first out keeps products fresh. No more shaking the bottles to get the sauces to the opening. FIFO for any liquid condiments! Only, this is just bigger. Easy to fill with bigger openings. I recommend this item . I give it 4 stars! Sir Clean recommended 32 oz. 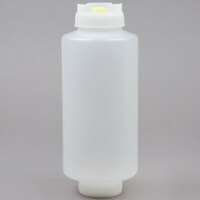 First In First Out "FIFO" Squeeze Bottle with Lid for the quality and price, you can use for different purpose. This bottle holds a lot. Huge 32 oz squeeze bottle is perfect for our restaurant needs. Always product with the first our feature. Nice price. the 32 oz FIFO bottles are amazing. I thought it was going to be too big for what we needed them for but they've worked out great. Store and distributes ketchup and other condiments very easily, we refill every couple of weeks. This squeeze bottle is great, specially because contents won't get spoiled due to old condiments, due to it's first in first out tech, highly recommend for every kitchen, must have several. Love that you fill these from the bottom and use the mayo from the top. So easy to fill and use. We have 4 of these in use at all times. Very heavy plastic so it seems to be holding up well. i really like how much these hold. we use them for frostings and glazes. but they get stuck when they are squeezed n and you have to constantly open them to let air in. Such a great bottle! No dripping whatsoever which is wonderful and it stands great on a flat surface, no easy tipping! Great to know that you're also not using old sauces or dressings since you fill it from the opposite end. Cleans great through the dishwasher. This is such a great way to store and distribute product. It's very easy to clean and it every drop of the product is used. I highly recommend it--if fact will be buying 12 more! This is so nice! We go through a lot of condiments and the size it perfect. Plus, I don't have to worry about old stuff building up on the bottom. This is a huge squeeze bottle. Too big for most applications for me, but if you have a really high volume condiment that's always running out, maybe this is for you. I bought one of these bottles to check it out, being skeptical that they be worth the cost. Being able to store the bottles upside down really helps get that last little bit of sauce out tho! I give 5 star * * * * * these item its perfect for my store I use for the nutella I use other bad for clean this its easy to clean! recommend! A different kind of squeeze bottle that you can fill on one end and squeeze product out on the other. This makes it easy to use the entire contents and then cleans up very quickly since the bottle can be opened on both ends.